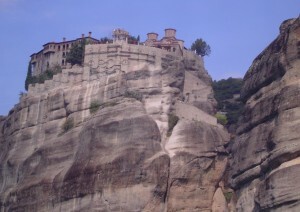 We climbed many switchbacks up to the cliff-face home of the monasteries that fear built. There were many monasteries in Greece until the Seljuk Turks began to invade from Mongolia in the 11th century. During that time, few places in Greece were safe. [An analogy would be Great Britain vs. the Vikings in the 9-10th centuries]. 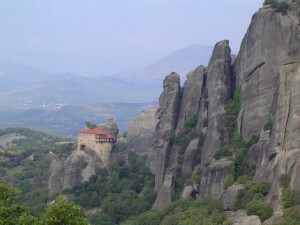 So the nuns and monks moved to the cliffs of Meteora, where they built strongholds on the unassailable pinnacles. Originally, there was no access to the strongholds, but a pulley system for bringing up supplies and the occasional intrepid monk. Not until the 1920s were steps carved into the cliffs and hydraulic lifts were added in the 1960s. When we arrived, construction vehicles vied with tourist busses for access; tiny, crowded flea markets perched on the verge of the twisting road. Our first stop was the nunnery of Roussanou Sta. Barbara. We walked up a modest 30 or so steps to a “plateau” where stood a facility with stand-over-the-hole toilets. [I cannot even imagine how the ladies in trousers managed.] Many more steep steps and one drawbridge later saw us taking in a spectacular view down the ragged crevices. There was a small entryway, with the old gong for calling the nuns. There a young nun took our tickets whilst painting small white rocks with the name of the monastery, its picture and your name on the back. For €2! I really could do that all day for Christ. “Does anyone know why the blood of Christ on the cross flows onto the skull beneath?” he queried. “It is the redemption of Adam.” I answered. 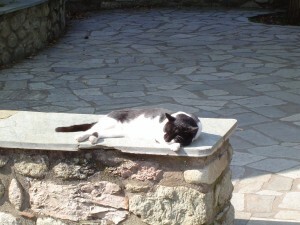 Returning down the stairs, we met a cat walking along the baluster, but heard much ruckus from the bushes. Turned out that her 2 kittens wanted her to get away from us and pay attention to them! With much mewing and other ado, one managed to scale the wall with the help of a tree branch. He quickly retraced his steps after seeing the crowd. His momma greatly enjoyed the petting. Later, we saw 2 nuns feeding some cats by the roadside. The next stop was a monastery with 120 steps, which we declined, as several others did. 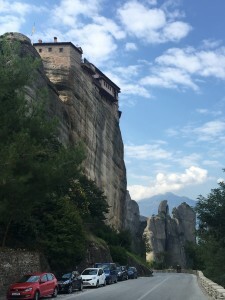 We took loads of photos and wound up in a wonderful shady piazza, walled with benches and overlooking the gorge, across which a cable car, the size of a pick-up truck-bed, hung from a lax cable. This led to a fairly new door in the monastery wall. The older winch hung from a lip a hundred feet above. Construction materials were being assembled 50 feet below us, for repairs to the building. We watched the people go by and the flea market and eventually got our turn with a large black and white cat, who was working the crowd for love. She finished up with a woman and her adult retarded son, and then jumped up to the parapet near us. I stroked her healthy fur whilst she and I sat in the sunshine. This was some of the best cat-love I have ever received! A young man approached, drawn by the cat and I invited him to join the group. He was from Spain and missed his cat. We talked about where we’d been in Spain and our love of the museums there; that we still wanted to go to Madrid to the Prado and to Granada for the Alhambra; he said that we really must. So there’s another trip. 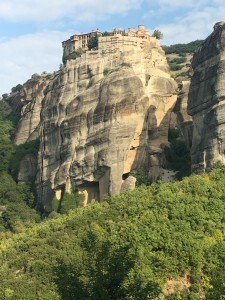 For 600 years, men and women joining the monasteries donated their land as a dowry, so that now the Church owns about 20% of the land in Greece. As it was in Europe before the Protestant Reformation. Back on the bus, we made our way to Cousin Vinny’s¹ very fine authentic icon workshop [Zindros]. They make the icons the old fashioned way, with hand carved wood, real gold and 1001 coats of thin varnish and therefore, they are fabulously expensive. They did have small reproduction icons like the one we bought of St. Paul, but not Irene nor Zoe, our favorite Greek-saint-named ladies. So we shopped the CTC in the basement and bought Zoe a plush frog purse, which I think she would like better than an icon anyway. We crossed the plain of Thessaly, once a lake, now fertile farms, due to the 6 million years of eroding of the rivers on the mountains, turning them into canyons, crevices and fantastic spires. Current thought is that the lake drained into the Aegean after an earthquake. 1 Cousin Vinny’s: a stop on a bus tour that involves a store, often with a demo of what they make there and a long opportunity to purchase. Always includes restrooms. 2 Trough: an all –you-can -eat buffet. Always looks more delicious that it is. 3 CTC is Cheap Tourist Crap. It is not necessary inexpensive. Often to be found in Cousin Vinny stores. One must sort through and can sometimes find treasures.